How do you know you are really and truly a Christian? Soli Deo Gloria Publications, Pittsburgh, PA: 1993. This work is Matthew Mead’s (1629-1699) most popular and well-received work, both in his day and in ours. 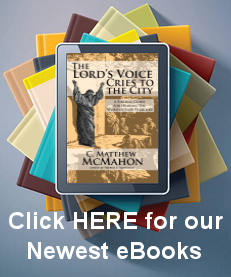 It ranks among the top 10 books on the Soli Deo Gloria website for all-time best sellers. Tis’ no wonder why. Not only was Mead effective in his preaching in Stepney, London, but his aptness to teach and preach is clearly seen in this polemic work even for the Christian of our own day. The damning heresy of easy believism is a stench in the nostrils of God in the “Christian” pulpit today. The Puritans in no way accepted the common ideas of “easy believism” and “cheap grace.” Men do not simply walk the isle and become Christians. They must be born again of the living Branch and abide in Him, lest they miscarry unto damnation. But it is with this who think they are saved and are not that Mead is dealing with in this work. He describes how much and how far a man may go, even to the point of having some affects of the Spirit in his life, and still miscarry to hell. The Puritans, like Christ, made a great distinction between real faith which is planted in the “good soil” and the spurious faith of those that spring up for a time, no matter how long that time may be. Many who have read this book do not come away with a “warm fuzzy feeling.” They read this book then sit in contemplation as to whether they are truly saved or not. Mead is not trying, though, to pull grace from the true believer’s heart, but he is weeding out those problematic ideologies which cause men to think they are saved when in fact they may not be. I enjoyed this work especially for that practical reason: it is not a book to read and put on the shelf. It impels you to reflect on your own life and examine your Christian walk before God. This work comes highly recommended by all neo-Puritans who love the Christ of the Bible. A Christian is a disciple of Jesus Christ, one who believes in and follows Christ. Now a man may have his understanding enlightened and yet his will not at all sanctified. Common knowledge is that which floats in the head but does not influence the heart. It is a great deceit to measure the substance of our religion by the bulk of our profession, and to judge of the strength of our graces by the length of our duties. No man was ever kept out of heaven for his confessed badness, though many are kept out of heaven for their supposed goodness. The ground of many a man’s engaging in religion is the trouble of his conscience, and the end of his continuing in religion is the quieting of conscience. There are two things very hard: one is to take the shame of our sins to ourselves, the other is to give the glory of our services to Christ.